After winning the 1981 Heisman Trophy at USC, Allen was chosen by the Raiders in the first round of the ’82 draft. In the strike-shortened 1982 season, he led the NFL with 1098 yards from scrimmage, 14 TDs, and 84 points. For his efforts, he was a consensus Rookie of the Year and first-team All-NFL selection and was chosen to the Pro Bowl. He gained over a thousand yards rushing in each of the next three seasons, with a high of 1759 yards in ’85, which led the league along with his 2314 yards from scrimmage. He also topped the league in touchdowns with 18 in 1984 and was the MVP of the Super Bowl following the ’83 season, after rushing for 191 yards. Allen was a proficient receiver out of the backfield, catching a total of 237 passes in his first four seasons. He was a consensus first-team All-Pro in 1982 and ’85, when he also received MVP recognition, and was selected to the Pro Bowl five times. However, after 1985, Allen never again ran for a thousand yards or caught more than 51 passes in a season. Bothered by injuries (and involved in disputes with owner Al Davis), he shared time with other running backs during the remainder of his career with the Raiders, most notably Bo Jackson. Having rushed for 8545 yards on 2090 carries (4.1 avg.) and caught 446 passes for another 4258 yards (9.5 avg.) and scoring a total of 98 touchdowns, Allen left the Raiders for the Chiefs in 1993 and took over the starting running back job from Harvey Williams during the season. Chiefs went 11-5 to finish first in the AFC West. Won AFC Wild Card playoff over Pittsburgh Steelers (27-24) and AFC Divisional playoff over Houston Oilers (28-20). Lost AFC Championship to Buffalo Bills (30-13). 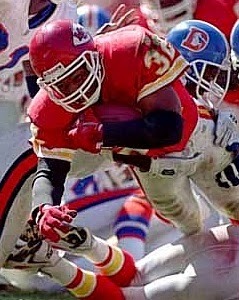 Having reinvigorated his career, Allen played another four seasons with the Chiefs, still scoring 11 TDs as a backup in his final year at age 37. He retired in 1997 with 123 career touchdowns, as well as 12,243 rushing yards and 587 pass receptions (the record for a running back at the time) for another 5412 yards. Of those totals, 3698 rushing yards and 1153 receiving yards came in Kansas City. Allen was inducted into the Pro Football Hall of Fame, Class of 2003.